Biome has created this effective and very pleasant smelling insect deterrent mist spray. Non-toxic, vegan and palm oil free, safe for children from 3 years and kind to sensitive skin types. In a reusable glass bottle to be zero waste and almost plastic free. Carefully chosen range of essential oils that bugs, flies, mosquitoes and even ants just hate, but adults and children like. 200ml. Uses plant based oils rather than synthetic chemicals to protect your family is better for you and the environment. Zero waste: packaged in a reusable and recyclable amber glass bottle. Suitable for use on body and clothes for optimal effectiveness. Deet free, no synthetic chemicals whatsoever - pure essential oils only. Deters mosquitoes, flys and other insects. Safe for children and kind on sensitive skin types. Non-greasy with a pleasant, non-irritating smell. Contains essential oils which may help prevent infections if bites have occurred. Demineralised water, sugar fermented ethanol, pure and ACO certified organic essential oils including Eucalyptus, Citronella, Rose Geranium and Lavender. 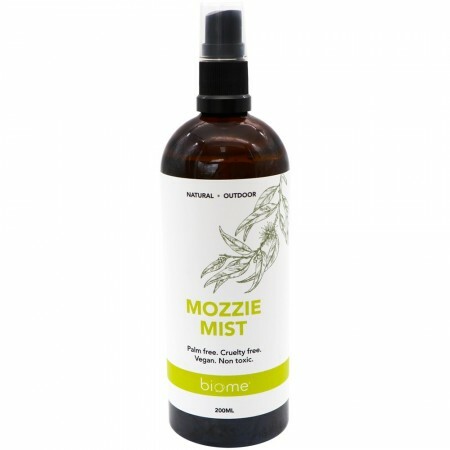 Browse our other mozzie deterring products. I love the smell of this. So nice to apply mozzie spray and not be gagging from the chemicals. I haven't used this in the summer yet, when the mozzies are at their worst (I live in the tropics), so we'll see how it goes under pressure! Has worked great so far for the midgies that are around.